What do you do when your industry approaches market saturation and increased public opposition? This is the question the peddlers of automated ticketing will have to start asking themselves in the immediate future if they hope to survive in any form whatsoever. Almost all large United States cities have been approached by either Redflex or American Traffic Solutions pitching the tired, debunked claims of improved traffic safety. Unfortunately for these companies, voters and drivers have awakened to the scheme and are opposing new and existing systems worldwide over a variety of reasons, from civil liberties concerns to the proper role of government. Smaller and smaller communities are being being swindled into signing contracts with these corporations, resulting in millions of dollars being extracted from local economies and sent directly to the profiteering vendors. The blowback to such installations has ranged from expected opposition to cold-blooded murder. Last week, the confessed shooter of a Redflex photo radar van driver in Arizona was sentenced to 22 years in prison. Unclear is the liability the State of Arizona will face for their “romp in the bed” with corporatism in the form of photo enforcement. Redflex was contractually obligated to provide “public service announcements” to explain automated ticketing to the public when the statewide ticketing contract was signed with the Department of Public Safety. DPS is now being sued by the surviving family, and rightfully so. It doesn’t take an overpaid government beancounter to figure out that placing an unarmed civilian in a vehicle falsely marked as law enforcement is a bad idea. With an onslaught of bad publicity, automated ticketing vendors may remember 2010 as the year their business model went sour. Lawsuits demanding refunds plague Redflex in Minnesota to the tune of millions of dollars while increased legal challenges in Florida and California threaten the very existence of red light cameras and so-called speed enforcement. The Cameras are Coming Down… but in the end it may be due to the fatally flawed business model based on greed and inconclusive results that ATS and Redflex have depended on for over a decade. This entry was posted on Tuesday, August 24th, 2010 at 2:46 am and is filed under News. You can follow any responses to this entry through the RSS 2.0 feed. You can leave a response, or trackback from your own site. “cold-blooded” means a state that was very likely not present at that “murder”. it is not merely an obligatory term for drama enhancement. Or are ats employees posting again in morbid tone about their rival? I think the state got off too easy on this one. In olden days they used to tar and feather crooks/scoundrels/thief’s and run em out of town on a rail. While I think murder is going too far, has anyone thought that it might just be a little justified? Photo cameras/computer tracking of people is an abomination to a free society. How is the public to combat an arguably illegal imposition on the public’s rights with a corrupt government and court system? While I do not condone the man’s actions, I do feel sorry for him. As for the man who got shot, tar and feather would have been a better option. As far as his family, they deserve to receive compensation for their loss, and I hope they get it. I hope Reflex and any other camera company get sued into oblivion! It is for safety. Has there been another terrorist attack in the US since they government has been more closely monitoring everything? NO! Has there in countries that don’t closely monitor things? YES! Which way do you want it? Have you seen any vampires lately? Must be due to the speed cameras! No, Alan, I never thought it was a little justified. He who trades liberty for temporary security deserves neither. What libery are you trading? The freedom to not be video taped or photographed while using a public road, provided by public funds, maintained by public workers, patroled by public paid officers, in a vehicle required to have clear windshields, only after taking a government test and paying a fee to receive a license, and then paying a fee to register the vehicle you are driving. They are subject to oversight, by DPS, by the Courts of Arizona, etc… They can be sued just like any other company if they defraud the public. Redflex is a vendor. The state of AZ buys a service from them. When you bought your pool cleaning service from Bob’s Pool Company, did that give you the authorization to look through Bob’s books and dealings. I think not. It took several years to get them to admit they were operating with falsified FCC docs. So maybe in 2017 you’ll learn what they really did with your personal info. Show Low,Arizona is a speed trap for a town…They have placed this camera..on a downslope…with a solid line(no pass) BUT…it is the only place big suv’s and boats can access Rainbow and Fools Hollow Lake..so the big SUV with boat and trailer barreling downhill on your bumper pass out of the camera range into the other lane missing the camera trigger and you get the ticket because you were doing the speed limit but their speed triggers the camera and they pass…right at ther bottom of the hill because they’ can’t ‘slow down’ without hitting you…So if they are passing in a direct line with your car in the oposite lane…the sensor is triggered…you pay the ticket….The court is aware of this and instead of dismissing the ticket…they reduced it by half…but leave a speeding infraction on your license …raising your insurance due to the points…which costs an extra twenty dollars for insurance a monthew that does not get reduced for a year…Insurance loves speed cameras…Thirty percent of speed camera tickets cvited were getting paid…70% Not…So they dropped the cameras in Phoenix…but Redflex sold the cameras to Show Low…whic lowered speeds limits to put the eight cameras in around a very rural town…I will not spend money in Show Low and am telling evry person I know to spend elsewhere because of the entrappment…with cameras placed on down hill slopes with cars slowing down on the entrance of the city.. Sorry, prove that this happened. The sensors and pictures have “lane of Travel” stamped on the pictures themselves. And the video of the incident will show the passing SUV in the 10 secon video that is required with every citation. And how much are these paid artists that doctor up Ticket Photos for Redflex, and then doctor up frame by frame video for them as well? How much are you paid to comment on this website? What does their salary have to do with anything? It takes a whopping 2 minutes to cut and paste text on a photo. They must pay pretty good being that nobody has come forward saying “I used to doctor photos for Redflex. You should read the lawsuit. The family is sueing because the actions of anti-camera people warranted added measures to protect the vehicle occupant. So when the anti-camera nutjobs started taking pickaxes to the cameras, DPS should have provided protection for the camera operators. It is because of people like Camerafraud.com followers, that the family feels they needed to be protected from YOU!!! And they are now sueing DPS. Really? That makes sense to you that police officers should be protecting civilians doing a police officer’s job? That makes no sense. YOU read the lawsuit. It says no such thing. If it was the “anti camera” people (the majority of Arizonans?) wouldn’t the family have sued CameraFRAUD? Carry on, though. You’re good entertainment. From Camerafraud’s own provided information. 18. The State and DPS had knowledge prior to ****’s death of opposition to photo radar, physical actions taken by photo radar opponents to damage photo radar vehicles and equipment, and the danger to occupants of the photo radar vehicles. Yet, the State and DPS permitted ****, a private citizen, not a sworn police officer, to work in a DPS marked vehicle without providing him any training or protection. 19. As a direct and proximate cause of the Defendants’ conduct, ****’s life was taken. They are sueing because the State and DPS did not help the deceased protect himself from people like you guys. Names left out to avoid the comment being sensored. Previous articles had my comments stopped due to use of the family names. CF is not the only opposition to photo enforcement. 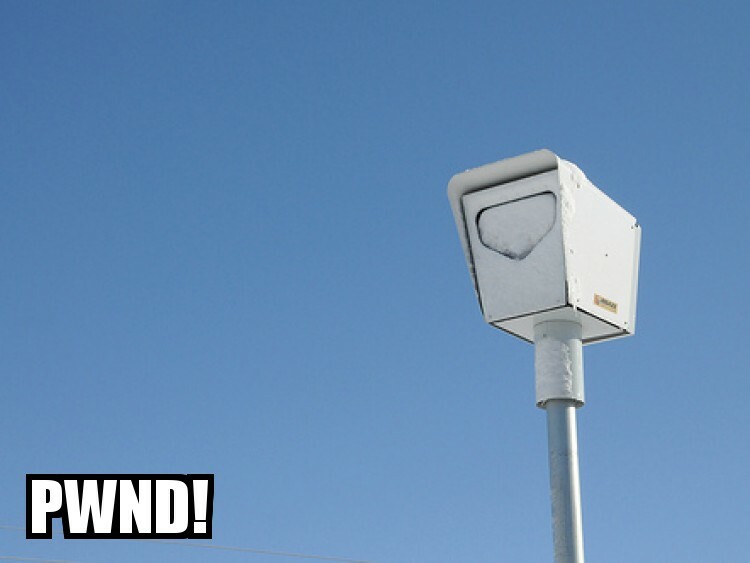 As you will soon see at the ballot box, about 75% of Arizona opposes photo radar. They are not all members of CF. As you will soon see, the large majority of your “Supporters” were opposed to Freeway speed cameras ONLY. And it was nowhere near 75% of the voters in this state. Wow – So you’re actually admitting that there’s a significant percentage of Arizonans that thought the highway speed cameras were a bad idea? I don’t think it was 75% either, but I’d have put the numbers at 60/40 anti-speed camera. Actually admitting? I like the speed cameras. I do believe that the photo enforcement should be applied like a parking ticket to the vehicle and not treated like a regular ticket issued by an officer (like they are administered in other states). But yes, I do believe that the opposition to photo enforcement was primarily a reaction against the “Democrat” lead highway speed cameras and not the Red light and school zone cameras. Also, the only reason red light cameras are supported is because they don’t have the real facts about accidents, the cut the cities and the camera companies get, etc. Finally – Since you either ignorantly misunderstood (work on those reading comprehension and/or listening skills of yours) or intentionally tried to change what I meant, yes – you were actually admitting that a majority of Arizonans thought that the speed cameras were BS. I also said nothing about applying them as parking tickets in my last post, so why bring that up at all, other than to deflect what I said or to argue aimlessly forever? blaming us just like DPS did. that’s pretty low. This battle against an assault on privacy is only going to become more and more extreme as governments fight the people over this issue of technology in law enforcement. John Hook said after interviewing Destories that he believes he’s telling the truth about not thinking anyone was in the van. He should have thought about that before he opened fire on a police vehicle. Good riddance. I’d love to say the same to you and your assertions. There seems to be a lot of people these days for organic cleaning agents… I have had some really difficult timeswith these not really doing enough to actually “clean”. Any recommendations out there? By the way, great article thanks! i like your article.good luck! him. Pretty sure he’s going to have a good read.